Urijah Faber had some strong words in response to his opponent's recent trash talk. Urijah Faber is nothing if not brutally honest when assessing an opponent’s threats as he gets ready for an upcoming bout. When asked about the danger his next opponent Michael McDonald brings into their fight at UFC on FOX this weekend in Sacramento, Faber complimented the 22-year old prodigy but said that ultimately there’s only one way he wins this fight – by knockout. McDonald’s hands are some of the most dangerous in the bantamweight division and Faber is well aware of that fact. The reason Faber acknowledges that fact that McDonald is so dangerous on the feet is because he knows there’s no other strategy he could possibly have to win this fight. "I think McDonald, for me, I know what he wants to do. He wants to strike with me. 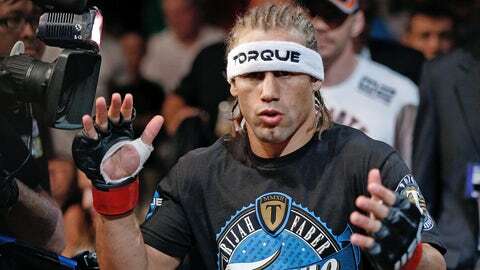 He doesn’t want to go to the ground with me and make it a ground fight," Faber told FOX Sports. "So as far as one-dimensional, does he have a lot of dimensions? Sure. Is he able to submit guys? Sure. Is he able to take guys down? Sure. But compared to me and what I know he wants to do, I feel like he’s going to be one-dimensional." Earlier this week, McDonald told FOX Sports that he believes Faber even admitting that he’s worried about the knockout is a ‘weakness’ and he will happily expose that chink in his armor come Saturday night. So what did Faber have to say about McDonald’s jab saying he was weak mentally? "I don’t have any weakness when it comes to the mental game. I think I’m as strong as it gets. I think I’ve illustrated that. The truth is that’s the only way he wins this fight," Faber said. "There’s guys that he’s lost to - are they at my level? Are they better than I am? Are they more durable than I am? I really, really doubt that. I’m one of the most dominant guys, one of the most durable guys. If he thinks that I think he’s going to knock me out, he’s smoking. That’s his chance and he knows it." Regardless of the pre-fight trash talk that exists between Faber and McDonald right now, both fighters know that this bout could be the show stealer once UFC on FOX in concluded. Faber isn’t quick to call anything a ‘Fight of the Night’ before it happens because as everyone knows that generally backfires, but he knows this bout has the possibility of being one of the best of the year. "As far as ‘Fight of the Night’, you never know until that night," Faber said. "We’ve got Joseph Benavidez fighting for a world championship against Demetrious Johnson, two super exciting fighters. Chad Mendes with knocking everyone out against Nik Lentz. There’s a lot of great fights on the card, but yeah if I had to give anyone the edge it would be McDonald and myself." The winner of Faber and McDonald could very well be in line for a title shot in 2014 against the winner of Renan Barao and Dominick Cruz at UFC 169 so there’s plenty at stake when the two bantamweight contenders square off in the co-main event on Saturday night. If he thinks that I think he’s going to knock me out, he’s smoking. That’s his chance and he knows it.